Staying in a small, owner-run hotel ensures an authentic experience and personalized service. Here, The Good Hotel Guide selects five of the best small hotels in Tuscany from their collection. All are set in historic buildings and offer great value. The Relais Uffizi is set in a restored 16th-century palace on a little pedestrianized street next to the Uffizi Gallery. The rooms are homey and comfortable rather than grand, and are decorated in soft pastel colours and furnished with antique prints and canopy beds. The hotel has a bar and a lounge, and is close to many restaurants. Set on a hilltop in a residential area northwest of Florence, the great value Pensione Bencista offers a tranquil retreat within easy access of the city. 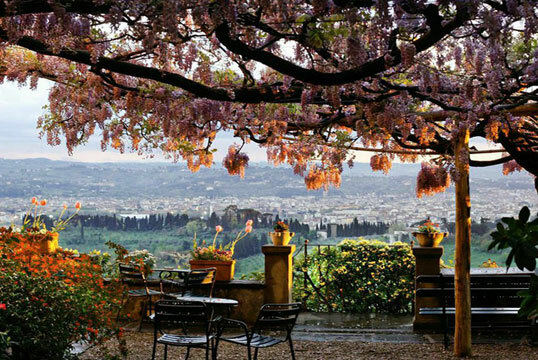 There's a restaurant with a terrace, from which you can watch the sunset over Florence, as well as a spa and several sitting rooms with great views. The rooms are bright and spacious and furnished with antiques; No 21 has the best views. 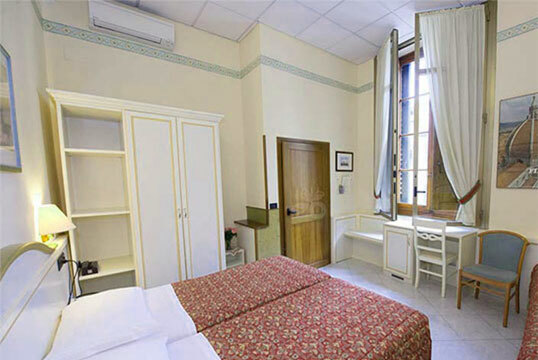 Hotel Casci isn't fancy, but considering its location (150 m from Florence Cathedral) the rates are very reasonable and the owners, the Lombardi family, pride themselves on being some of the friendliest hoteliers in town. The exterior is unremarkable but the hotel itself is set in two villas dating from the 15th century, parts of which were once a convent, and the dining area and lobby have lovely frescoed ceilings. The small town of Pietrasanta, with wooded hills behind and sea stretching out in front, is a 30-minute train ride north of Lucca. 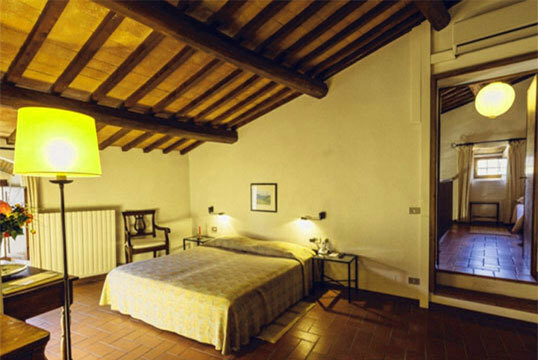 The Albergo Pietrasanta is set in a 16th-century former palace. 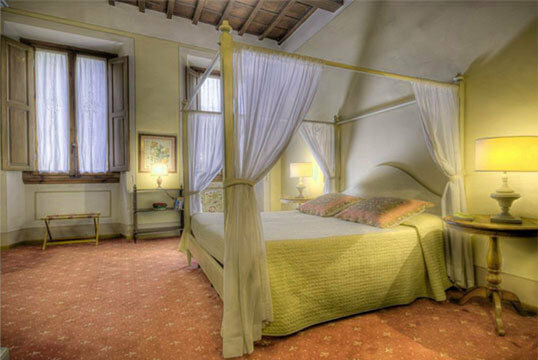 The rooms are elegant, with high ornate ceilings, and furnished with antiques, and some have frescoed ceilings. Breakfast is served in the conservatory (above), and there's also a charming courtyard garden. Villa Sangiovese stands on the corner of a tiny square in the small, unspoilt Tuscan town of Panzano-in-Chianti. It is set in a 15th-century former winery with elegant rooms, and offers attentive service and scenic views of distant hills and mountains. 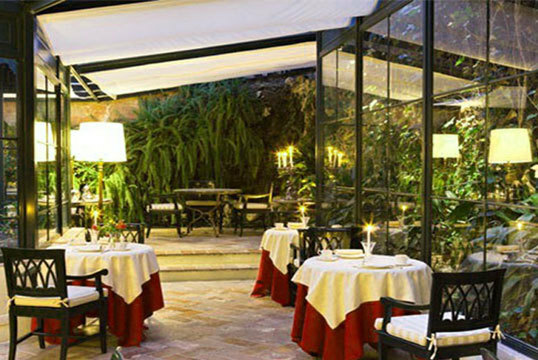 Excellent Tuscan fare is served in the restaurant, which has views of olive groves and vineyards. See more hotels in Italy from The Good Hotel Guide here.